HOPES: The Hope Street Association was formed in the early 1990s as a result of widening the work of the voluntary group CAMPAM, the Campaign to Promote the Arts on Merseyside. HOPES is a registered ‘arts, education and regeneration’ charity with about 150 paying members (almost 50 of them local institutions etc). We also have a large number of ‘associate’ partners who do not as paid-up members actually subscribe to HOPES; no-one is ignored and all are welcome. HOPES has no formal funding except for grant-aid to support some artistic activities, and the organisation is run by an elected honorary Executive Committee – on which representatives of both Cathedrals are ex-officio the two Vice-Chairs – and by young graduate and local community volunteers. We provided the secretariat for the 1998 Liverpool Windrush celebrations; we arrange small-scale (often musical) events in community settings, as well as open-invitation (free) social gatherings such as the HOPES Not-New-Year Party; we hold occasional debates on arts and regeneration topics; and, every year, we bring together a wide range of people to share the HOTFOOT Midsummer Concert at Philharmonic Hall to which many people in our various communities are invited. HOPES was chosen in 2,000 by the Millennium Commission from events across the nation as its exemplar Community Festival, and we gave a presentation in London on our activities to the Commissioners and the Secretary of State. 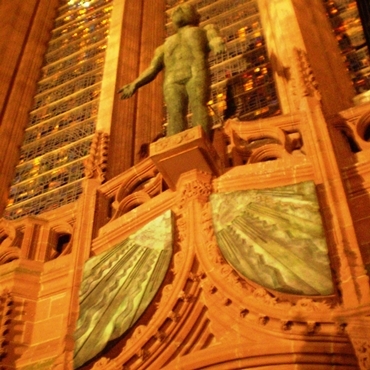 An example of close liaison and involvement with faith communities would be the Faith in One City concerts of music by composers of given religious affiliation which our partner organisation Ensemble Liverpool (a group of fully professional recital musicians from the Royal Liverpool Philharmonic Orchestra) gave in both Cathedrals in 2004. In the year 2,000 we published the Hope Street Papers, a dialogue on Art at the Heart of inner-city regeneration. Similar debates were published in 1999 and 2001. We have over the past ten years consistently lobbied, and indeed produced quite detailed plans, for the improvement of the public realm in our Quarter. The support of the Cathedrals in this process has been invaluable, and over time the City authorities have come to understand why such improvement is so important. We have now been told that work on these improvements will actually start in Spring 2005. HOPES is also leading the development of a public art route representing many interests in Hope Street. We have close links with many national organisations, such as the British Urban Regeneration Association, the Conservation Foundation, the National Campaign for the Arts and the St. William’s Foundation, as well as connections with government bodies such as the Office of the Deputy Prime Minister, and regional and sub-regional groups like the North-West Business Leadership Forum, Liverpool Vision, Stop the Rot and many others. We also work to nurture the knowledge economy in and around our Quarter, whether this be Big Science, large arts organisations, or smaller-scale bodies. This work is central to local economic growth and benefit. Everything we do is focussed on building a genuinely inclusive and forward-looking sense of Community Spirit shared by all partners in the area between our two great Cathedrals!